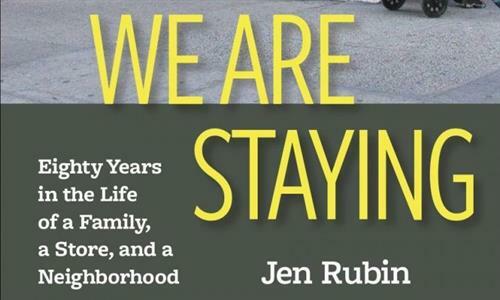 From Jen Rubin: We Are Staying: Eighty Years in the Life of a Family, a Store, and a Neighborhood has been reviewed in the Progressive Magazine and in my New York Times Op Ed. We Are Staying: Eighty Years in the Life of a Family, a Store, and a Neighborhood tells the story of my family's small business, Radio Clinic (later RCI). We Are Staying answers the question of what exactly does a neighborhood lose when it loses a long standing small business. Radio Clinic anchored 98th and Broadway on Manhattan's Upper West Side through the Depression, WWII, suburbanization, urban renewal, economic decline and the early years of gentrification. During those 80 years Radio Clinic repaired radios for free for the wives of neighborhood men fighting in WWII, was a foot soldier in the Cold War gathering information on Russians, and optimistically hung up a 'we are staying' sign in the window the day after the store was destroyed during the 1977 blackout and looting. We Are Staying is an immigrant story, a grandfather-father-daughter story, a story of the unique character a family business brings to a neighborhood, and a reflection on what has been lost as stores like these disappear. Radio Clinic resided in Manhattan, but the story of the loss of small businesses echoes across this nation. From small town Main Street to Ann Arbor’s State Street to the Upper West Side, family owned businesses have long supported and defined their communities. This story is unique but the loss is universal.